If you or someone you know is getting ready to embark on a year backpacking, career break or just a few months of adventure, our A - Z Backpacking Bible is a must have resource. Free to download, our A-Z Bible contains everything a backpacker needs to help prepare for an adventure of a lifetime. It can also be added to mobile devices such as iPads and Kindles so you can take it on your travels! Why download the Backpacker Bible? Taking a career break or gap year will be one of the most exciting things you do, and you'll come back with stories of adventures and hopefully none of those 'it could have gone really badly but thankfully it didn't' kind of stories. To help you get prepared before you head off, and for handy advice along the road, we've covered a range of topics from A-Z making it quick to find what you need when you need it! Get advice on what to do if you're bitten by a spider, snake or jelly fish. Learn about the 5 most common travel scams, how to spot them and how to avoid them. Get tips on how to eat healthy on a budget and for the more rare cases, we provide advice on getting legal representation should you find yourself in a compromising situation. 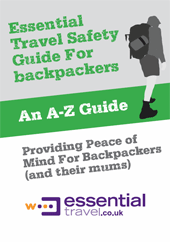 It's a must have read, for any backpacker! For a quote from as little as 30p per day, visit our backpacker insurance page.